Where to dine and drink during the year end holidays. This year, Christmas and New Year's Eve celebrations promise to be a tad merrier than most, given that the Gregorian calendar saw fit to place those holidays on weekends. That means more recovery time for those of us who want to finish off 2016—which has been dreadful for many—with a bang. If you're one of those folks, you're in luck. More restaurants than usual are open and ready to serve you on Christmas Eve, Christmas Day and/or New Year's Eve. On Christmas Eve, Caffé Niche (779 E. 300 South, Salt Lake City, 801-433-3380, CaffeNiche.com) is open until 9 p.m., serving their regular menu, plus holiday specials like wild organic mushroom bisque; shrimp cocktail; cioppino with crab, shrimp, mussels and mahi mahi; and Black Forest cake with vanilla gelato, Luxardo cherry sauce and crumbled pistachios. From 5-10 p.m. on New Year's Eve, a five-course dinner ($40) menu features items such as an amuse-bouche of eggplant and olive oil mousse; green goddess salad or wild mushroom bisque; honey tangerine granita; entrée options of "Barely Buzzed" filet mignon, Morgan Valley lamb chop or bouillabaisse; plus dessert selections. Current Fish & Oyster (279 E. 300 South, Salt Lake City, 801-326-3474, CurrentFishandOyster.com) is open for both lunch and dinner on Christmas Eve, offering their regular menu. Starting at 4 p.m. on New Year's Eve, Chef Phelix Gardner and his team present a special $70 four-course menu. Options include an oyster brie soup and a tantalizing selection of oysters from both coasts, burrata, crab cakes, whole Mediterranean branzino, banana prawn fideos, caramelized organic salmon, salads and desserts. Though very few details were provided as of press time, you can bet the NYE dinner at Fratelli Ristorante (9236 S. Village Shop Drive, Sandy, 801-495-4550, FratelliUtah.com) will be tasty and festive. They're offering a five-course dinner ($50), expertly paired with optional wines for an additional $50. For non-winos, there's also a full bar. Seating is available from 5-8:30 p.m.
Kyoto Japanese Restaurant (1080 E. 1300 South, Salt Lake City, 801-487-3525, KyotoSLC.com) is open for lunch and dinner on Christmas Eve, closed Christmas Day, then open again for lunch and dinner on New Year's Eve. Chef Peggi Ince-Whiting welcomes diners on Jan. 1 from 5-10 p.m. for Japanese New Year, as well. Her outstanding sushi, such as her baked lobster roll, strikes me as an excellent way to ring in 2017. At Oasis Café (151 S. 500 East, Salt Lake City, 801-322-0404, OasisCafeSLC.com), Chef de Cuisine Efren Benitez greets New Year's Eve revelers beginning at 5 p.m. with a creative menu that includes starter options like a pan-seared scallop or tower of grilled vegetables; a choice of white bean and radicchio salad or creamy shrimp bisque; pan-roasted halibut, thick-cut prime rib or herb-crusted chicken breast; and dessert choices of dark chocolate cheesecake, roasted honeyed pear with Mascarpone cream or frozen Carlota de limon. The cost is $45 per person, plus tax and gratuity. 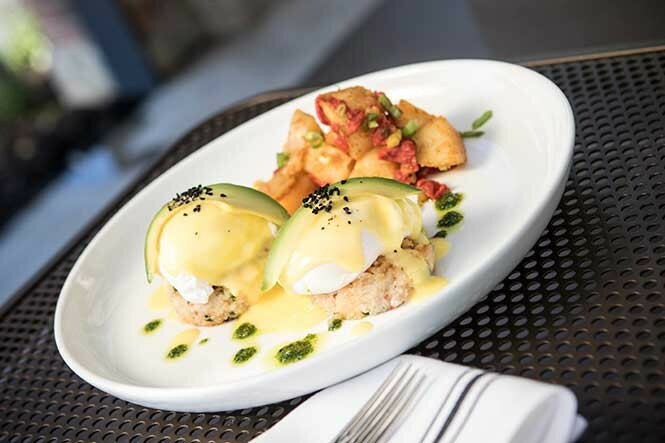 Oasis is also open on New Year's Day serving brunch from 8 a.m.-2:30 p.m. Owner Eric DeBonis is pulling out all the stops for the holidays at The Paris Bistro (1500 S. 1500 East, Salt Lake City, 801-486-5585, TheParis.net)—a warm and festive place to spend time with friends and family. The restaurant is open for dinner at 4 p.m. on Christmas Eve and Christmas Day, offering their full winter menu plus tempting holiday specials like coq au vin, Utah turkey roti and my favorite, Alsatian-style choucroute garni. For New Year's Eve, guests can enjoy a five-course "Midnight in Paris" dinner ($89.99 plus tax and a 20 percent service charge) with a multitude of options. Just a smattering of the tempting menu items includes buckwheat blinis with American sturgeon caviar and Kumamoto oysters; foie gras de canard au torchon; chestnut soup; Angus prime rib roast with Burgundy black truffle potato purée; pan-roasted Chilean sea bass, langoustine, carrot and leek mousseline with lobster nage; wild mushroom and barley risotto with black truffles; warm molten chocolate cake and much more. At Park City's Powder (2100 Frostwood Drive, Park City, 435-647-5566, WaldorfAstoriaParkCity.com) in the Waldorf-Astoria, pop into the one-off NYE Après Ski Oyster Bar from 3-5 p.m. on Dec. 31 for two glasses of Champagne and unlimited oysters on the half-shell ($28). Powder's special New Year's Eve dinner starts with a West Coast oyster, followed by apple rutabaga bisque with Utah goat cheese, fennel and maple sherry gastrique. Then enjoy a choice of black garlic chicken, spinach, potato purée and leeks; king salmon with sunchokes, dill, fennel and Brussels sprouts; or braised beef short rib with mushroom ragu, carrots, kale and horseradish potatoes. Dessert is a brown butter cheesecake with apricot, graham cracker and peach ($85 for dinner; $105 with wine pairings). Celebrating its first holiday season since opening, Stanza Italian Bistro & Wine Bar (454 E. 300 South, Salt Lake City, 801-746-4441, StanzaSLC.com) is open on Christmas Eve from 5-9 p.m. with both the regular menu and dinner specials, including Wagyu beef bavette, veal cannelloni, Caputo's burrata al forno and bûche de Noel for dessert. New Year's Eve brings a four-course menu ($65) with choices ranging from oysters on the half-shell with Prosecco-basil mignonette and roasted pumpkin soup, to lobster farfalle; casarecce alla Bolognese; gnocchi alla panna; prosciutto-wrapped branzino; Mary's chicken involtini; and desserts such as zabaglione and cannoli alla ricotta. Here's wising you happy and delicious holidays!